The Nanaimo Estuary is a busy place this time of year. 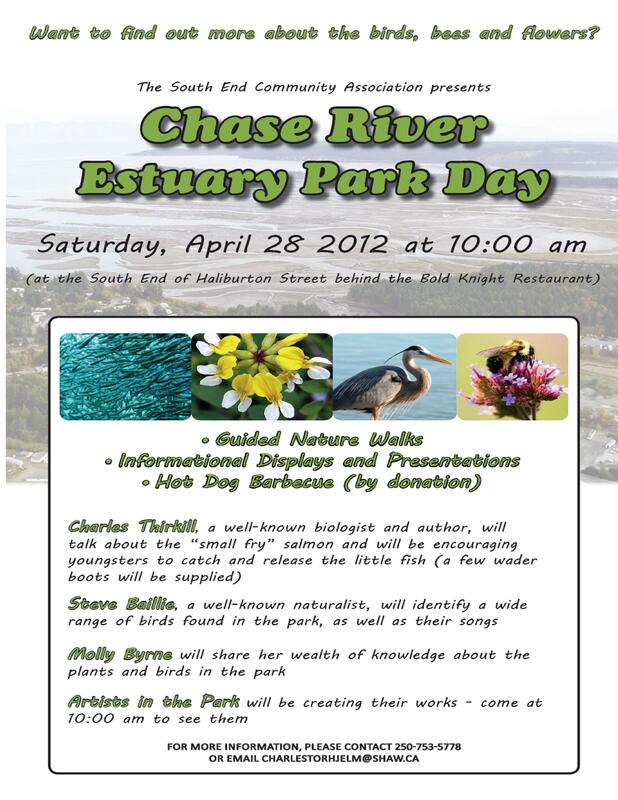 And Chase River Estuary Park Day, an event that provides hands-on education, will be held on Saturday May 8. You don’t often get the opportunity to see all the activity, but on Saturday May 8, you can, with the help of some local experts at Chase River Estuary Park. □ Charles Thirkill, a well-known biologist and author, will be talking about the “small fry” salmon and encouraging youngsters to catch and release the little fish who will eventually become bigger ones. A few wader boots will be supplied. □ Steve Baillie, a well-known naturalist, will be helping to point out the wide range of different birds in the park and their songs. □ Molly Byrne, a retired biology teacher, will share her wealth of knowledge about both the interesting birds and plants in the park. □ And Pamela Shaw, an adjunct professor at UVic and ardent estuary supporter will share some historical information about the Estuary, which contains fish weirs stretching back over 1,000 years. There will also be guided nature walks, displays and a hotdog BBQ by donation. “Chase River is a miniature version of the Nanaimo Estuary. It’s like a secret little spot hidden in the city,” says Rob Lawrance. You can access the park at the foot of Haliburton Street, just south of the Bold Knight restaurant. Organized by the South End Community Association, the free event runs from 10 AM until 2 PM. Click below for the poster. We did a second 2 hour walk on the evening of July 29 which took up where we left off on July 22 – which was from the Newport Pub site down Haliburton, by the IPI Facility and Snuneymuxw Reserve Site then across the highway and up Needham into the View Street area. The importance of Haliburton Street as a key pedestrian/vehicle link through the community and its importance as both a residential and commercial street. We also talked about the Coastlands mills site, including the impact of heavy industry on the area as well as its economic benefits. As John Horn, Social Planner for the City of Nanaimo, was along for the walk we also covered a number of housing and social issues in the area. We talked about the IPI issues and Nicol Street as both a barrier and an opportunity. We also revisited a number of issues and discussion points raised in the first walkabout. Having completed the two walks, City Staff are now looking at finishing up the research and data collection work started earlier this month and preparing the first Open House event planned for mid to late September. The next meeting of the Steering Committee will occur in early September and will be focused on reviewing the background information collected by staff and preparing for the Open House event. Thanks to Heritage/Community Planner Chris Sholberg for this report.